The cool and wet weather at the end of last week and the beginning of this week has temporarily halted picking. The light rain has washed some of the dirt off the grapes, and we’ll be ready to bring in more grapes as the weather remains dry. At this point, we have approximately one third of the grapes in the winery. Meanwhile, in the winery, we have begun pressing the Syrah. 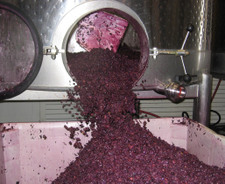 After fermenting for about two weeks in open-top tanks, the Syrah is now ready to be pressed. 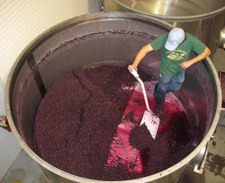 The juice in the tanks is pumped into a tank, and the remaining berries are transferred to the bladder press, where we squeeze out the remaining juice. The juice will spend the next several months in tanks and barrels, where it will complete primary and secondary fermentation before being blended next spring.